Almost exactly three years ago, during my first pregnancy, I made a top that reflected my then-obsession with the clothing website Modcloth. That garment looked like it could have been stocked by them, if they had a maternity range. Well, it seems as though I've done it again. This time I've made a tunic dress that may be reflecting the current Boden-bias of my Pinterest boards! Just look at this, and you'll see what I mean. I was an accident, I promise! As I wrote in slightly greater detail in my Spring/preggers sewing plans post, basically I'm not over this vintage Simplicity 7023 pattern (pictured below). 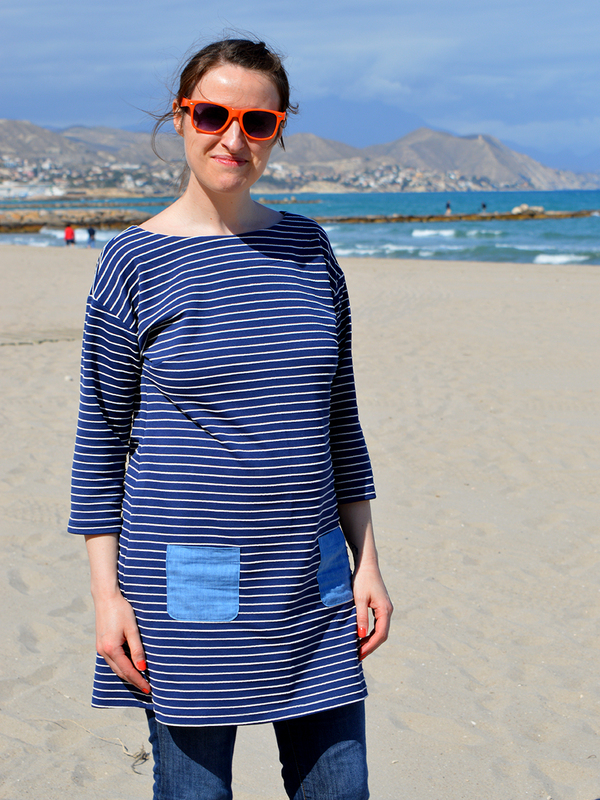 I love the 1960's Breton top I made from it so much that a longer tunic/dress variation was kind of inevitable. 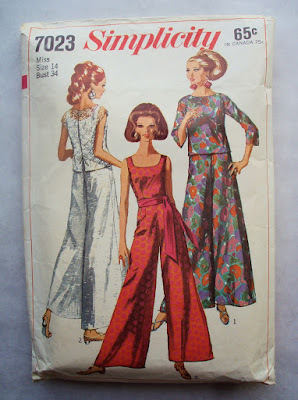 Ultimately, I think the best silhouette for a tunic dress version of this pattern would be more like this or this: basically, straighter. However, I wanted it to be something I could wear for a a good chunk of my pregnancy, so instead I frankensteined the above pattern with the Tova pattern to create a gentle A-line shape that hopefully still looks fairly straight but is a bit more accommodating. 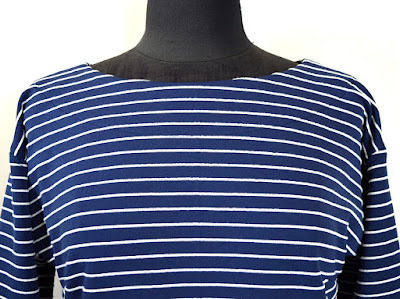 When I've finished being pregnant and stopped breast feeding, I'll skim the side seams in again so it will have something close to the silhouette I'd prefer. I was given about 1.7m of this amazing striped double knit from Josie, the owner of Fabric Godmother when I went to visit her at the end of last year. I fell in love with it hard but had already blown my fabric-purchasing budget on several other pieces. Yet she could see how much I yearned for it so kindly put me out of my misery and gave me a length! I wish I could link to it on her site but, as with so much of her stock, she sold out of it super quick so I'm afraid I can't. This fabric is either synthetic, or a blend with a heavy synthetic content, but it feels lovely to wear and not at all sweaty. It does, however, retain the benefit of not needing to be ironed at all! 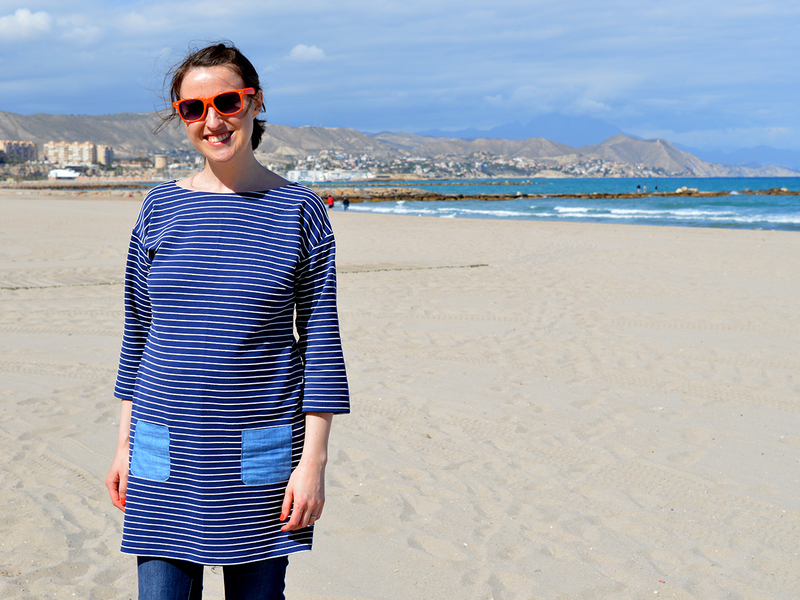 As you may be able to tell from these photos, I recent went on a little holiday (near Alicante in Spain) and it was the perfect garment to take as it doesn't crease at all (apart from the pockets, see below). 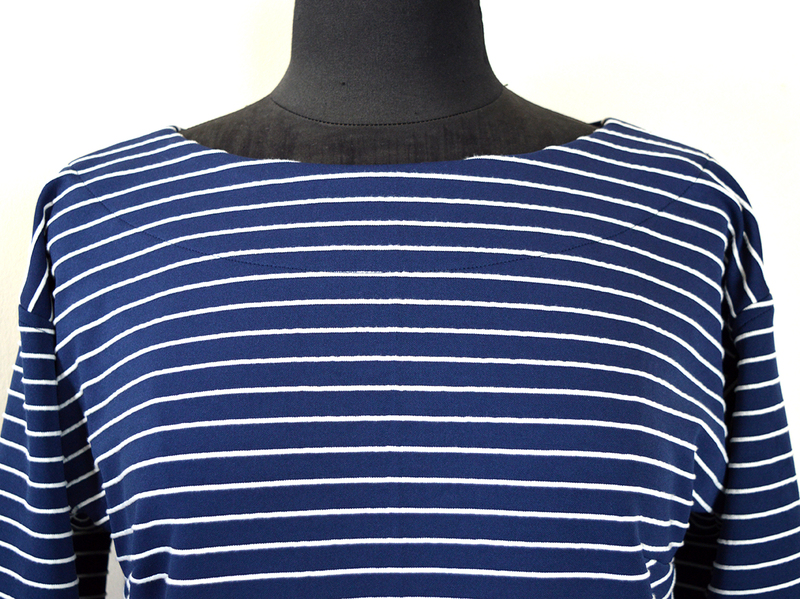 The only thing that was challenging about this fabric was the fact that the white stripes are raised. 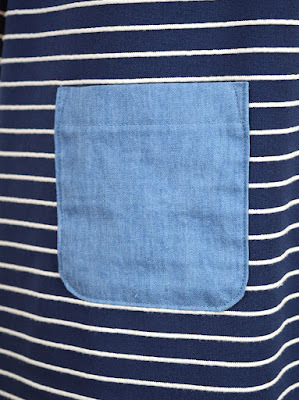 That made pattern matching at the centre back seam, side seams and sleeve seams pretty tricky as the stripes kept sliding off each other. The back seam looks less than perfect (not that I care because, you know, it's at the back) but I'd kind of got the hang of it as I went and the side seams and sleeve seams look ok. I probably should have unearthed my walking foot or something, but I was rushing slightly to get this done before my holiday. MAJOR SUCCESS. It could be argued that the tunic dress looks a tad frumpy in these pictures, but I really think that that's just the stage of pregnancy I'm at right now. I don't have the deliciously full, obviously-pregnant bump yet, but I said goodbye to my waistline months ago! 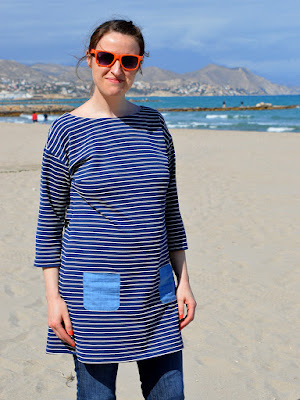 I wore this dress heaps on holiday, both with and without jeans underneath, depending on the temperature. 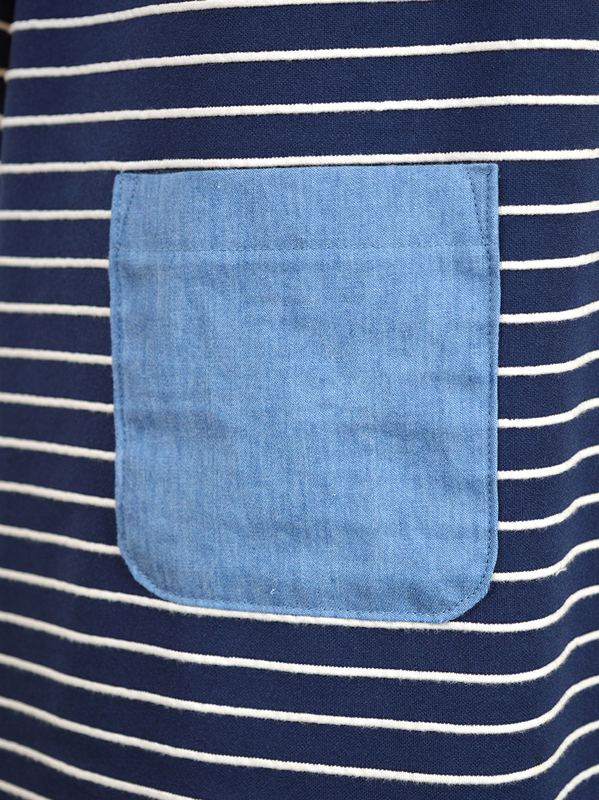 I'm really excited about its future incarnation with the altered side seams. I can see at least one more version of this pattern in my future. 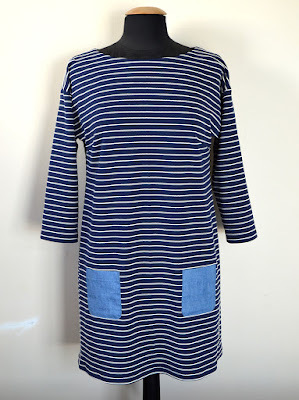 I'm thinking a basic black top, perhaps with oversized patch pockets, that overall with have a beatnik chick vibe, a bit like this. Now obviously that cost outcome is questionable, but I literally didn't need to spend any money between the point the idea for it struck me until it became a wearable garment, so I'm sticking with it! 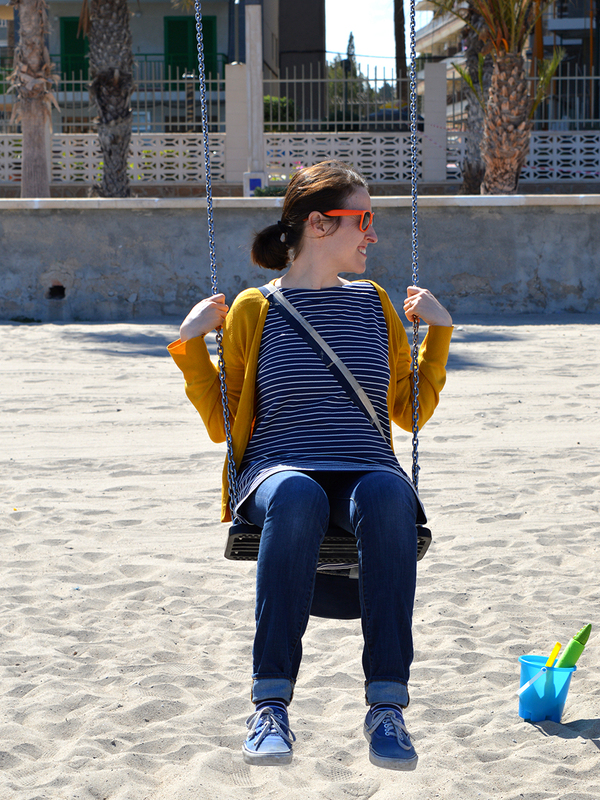 I can totally see this in the Boden cataog! But they won't beat your price! 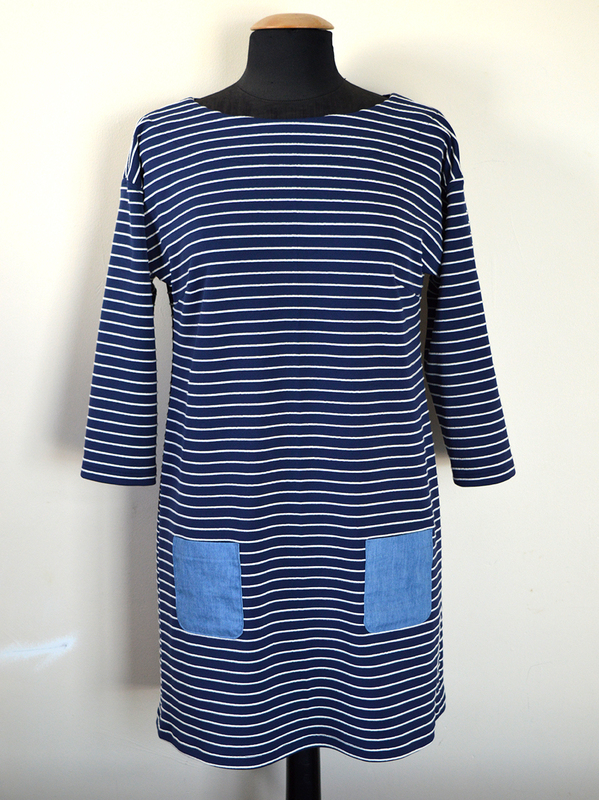 Fantastic dress, the addition of the denim pockets looks great. You are looking fantastic. Love it. I think I bought the exact same fabric in Cloth House last weekend - I only bought half a metre as I wasn't supposed to be buying fabric so am going to try and squeeze a tiny top out of it! 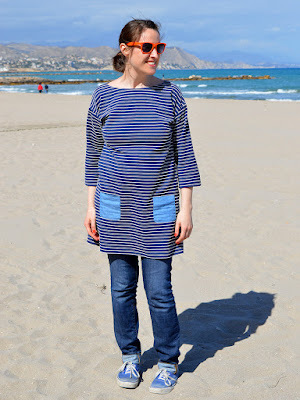 Lovely tunic - I've got what appears to be identical fabric - I was going to make a Coco, which will look similar I think. Oh, and thanks for the link - I made a badge!